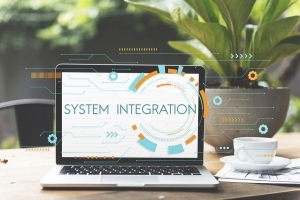 For any system integration, the basics include the message type, or the package that contains the information that is going to be moving back and forth. This might be an XML message, you might use an API library to communicate directly, or it could be something as simple as a flat file. The integration between the systems can be scheduled to either run in real time, like an e-commerce platform, or to run periodically, like a retail point of sale closing out at the end of the day. And integrations can be described as either being single direction or bidirectional. In any case, the source system will generate an output file, deliver that file to the integration tool, and then the integration tool then reads that toll and delivers it into destination system for processing — again, either in a sign direction or in a bidirectional path, like a CRM system. The challenge with doing a demo or a video for integration ERP systems is the integration toolset itself is a black box, and you really can’t see inside that black box very well. But to try to illustrate those principles, I want to use an older integration tool that has a lot of visual components that allow us to understand how these components work together. If I open an existing integration, in this case, GL transaction, I see the same components here that we are talking about previously. My source of information, in this case, I have two files, a header file and a detail file. I have a destination going straight to my general journal, and because I have two source files, I’ll need to find the query relationship between those. I can use the tool to preview my sources, see the data that’s coming in, verify that everything looks fine, it’s lined up the way I need it to be. I have two source files, and I’ll define the relationship between them: that’s simply any data element that the two files have in common — in this case, a doc number, but it might be an invoice number, might be a customer ID, etc. I can go through it, see how do I want to map data field to data field, and for those data fields, what type of information do I want to use — how will this be structured. I might use the use a system-wide default. I could also use constants or other values to get inserted by code. Those basics — the source of information, the relationship between those sources if there are multiple sources and one integration, the destination, or where to park the information code once it’s been processed, and then that field-to-field mapping — allow us to produce the final integration. Once that’s been mapped and the data source has been loaded, we are now ready to run that integration through. So again, to review the basics of any system integration, there are different message types that can be exchanged, the scheduling needs to be discussed and determined real time or in a periodic fashion, and what will be the directions we’ll follow — a single path or bidirectional path.